Biochemical oxygen demand (BOD) is a measurement that allows scientists to compare the relative polluting strength of different organic substances. The widest application of the BOD test, however, is for measuring wasteload concentrations to (influent load) and discharged from (effluent load) POTWs and other facilities and evaluating the BOD-removal efficiency of these treatment systems. From 1970 to 1999, $77.2 billion (as current year dollars) in federal grants and contributions through USEPA's Construction Grants and CWSRF programs was distributed to municipalities and states to upgrade POTWs and, among other objectives, to increase their BOD-removal efficiency. Did this investment pay off in terms of decreasing BOD effluent loadings to the nation's waterways? The purpose of the first leg of this study is to examine nationwide trends in both influent and effluent BOD loadings before and after the CWA. Chapter 2 begins with some background discussions to help the reader better understand the significance of the wastewater component of the urban water cycle and the pivotal role the 1972 CWA played in establishing the national policy requiring secondary treatment as the minimum acceptable technology for this component. Specifically, Sections A and B trace some historical consequences of not incorporating the wastewater treatment component of the urban water cycle. Beginning with ancient Athenians and moving through time, societies around the world suffered the results of releasing raw or inadequately treated sewage into waterways, including outbreaks of disease and the destruction of fragile aquatic ecosystems. Sparked by the Lawrence (Massachusetts) Experiment Station's discovery of the trickling filter method in 1892 and the development of the BOD test in the 1920s, many states subsequently adopted water quality standards and encouraged the use of secondary treatment for the purpose of protecting their waterways and water supply and water resource users. Unfortunately, rapidly growing urban populations and uneven applications of waste-water treatment funding and technology caused conditions to deteriorate in many highly populated watersheds in the first two-thirds of the twentieth century. Section C of Chapter 2 traces the evolution of the federal government's role in water pollution control during this time period. Key legislation is highlighted to document its movement from passive advisor through to the passage of the 1972 CWA, the decisive legislation that transferred authority for directing and defining water pollution control policy and initiatives from the states to the USEPA. Post-1972 legislation and regulations continue to refine water pollution control goals and objectives and authorize the funding and policies necessary to meet them. Twenty-five years after the passage of the CWA, the number of people served by POTWs has increased from about 140 million in 1968 to 189.7 million in 1996. In spite of this population increase (and corresponding increases in the amount of BOD flowing into these facilities), has there been a significant decline in BOD loading to the nation's waterways? Section D examines trends in influent and effluent BOD loading from 1940 to 1996, based on population served and BOD removal rates associated with various treatment levels. Section E helps put POTW effluent BOD loading into national perspective by examining rates and spatial distribution of BOD loadings associated with other point and nonpoint sources of BOD in addition to municipal loadings. Using USEPA's National Water Pollution Control Assessment Model (NWPCAM) (Bondelid et al., 2000), loading estimates were derived for urban and rural runoff, combined sewer overflows, and industrial wastewater discharges, in addition to municipal discharges. Comparison of these sources at a national level provides insight on how total BOD loading is distributed among sources in various regions of the United States. 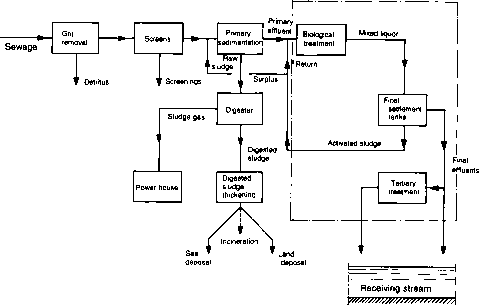 Section F presents a discussion of the investment costs associated with water pollution control infrastructure over the time period 1970 to 1999 and summarizes projections of future wastewater infrastructure needs into the twenty-first century.